We have seen questions related to the use of House addons for use in Keep & Castle designs. Your design will not be disqualified if you use various house addons, such as ladders, in the design of the building for staging purposes. Note, however, that these items will not be copied into the house placement tool. Only objects placed through the house customization menu will be copied over. Thank you and good luck to all our architects! Vaults will be available for rent once all shards have been updated. The Ultima Store will be updated when vaults are available. Fixed an issue with stone boots. ・Players can purchase an account bound vault token from the UO Store for 300 Sovereigns. ・A vault provides shared storage of 125 items across all characters for a specific account on a shard. ・Once purchased, the player must visit a vault manager located in select banks (Britain Commons, Bank of Delucia, New Haven Bank, Bank of Minoc, Bank of Moonglow, the Trinsic Royal Bank, Bank of Yew, Bank of Wind, and the Royal City Bank) within the world to rent a vault with the token. Only one vault can be rented at each vault manager location. ・The player will now have access to their vault for thirty days. The player must keep their vault token balance up to date or risk losing their items. Vaults can have a prepaid balance up to three tokens at a time. They can save their vault by paying the rent. Claim their vault with all their items if they have space in their backpacks. Do nothing which will result in the loss of their items. For the discerning architect, there is a tool available on Test Center that will allow submission of customized keeps & castles to be added to the list of available Classic Houses. To begin, head to Test Center and using a house placement tool select the “Custom House Contest” option to build a keep or castle plot. 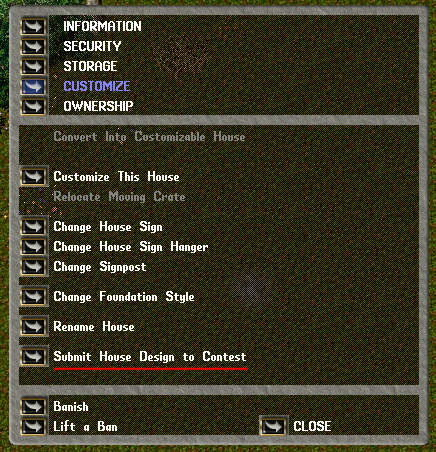 In order to participate a house must be set to pubic and the “Submit House Design to Contest” option must be selected from the “Customize” menu from the house sign. You must commit your design while it has been submitted to the contest in order to be valid. At this point your plot has been entered into the contest. You may continue to update your design at any point up until voting begins. After voting begins, you may not longer update your design. When the voting period begins, all active veteran accounts are eligible to vote. Visit the Britain Commons House Contest stone to view the list of entries, visit the plots, and cast your vote. 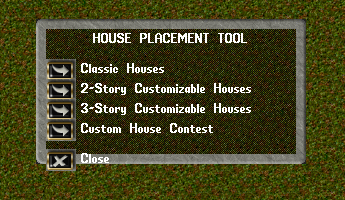 At the conclusion of the voting period, up to the top 3 vote getters will be added to the “Classic Houses” menu for placement in the next publish. ・Each publish cycle TC1 will be wiped and a new contest will be run so that multiple contests will be run each year. ・Following the conclusion of the contest, new designs will not be available until the current publish has been deployed to each shard based on the current publish schedule. ・Existing Keep & Castle owners may change their current house design to one of the new designs. Take note, however, that all house decorations will be moved to the moving crate when the transition is made. ・All submissions are subject to review for appropriateness and any that are found to contain design elements or names that are against the Terms of Service or deliberately attempt at undermining the spirit of the contest will not be eligible and will be removed from consideration. Customizable Keep & Castle Contest is available on TC1! You can read more about the tool and contest here. ・This is an early implementation of a new champ spawn coming to Dungeon Khaldun. ・The Champ Spawn will be available in both Trammel & Felucca. ・Visit the Britain Commons for a gate to the dungeon. ・Only the champ spawn creatures are currently implemented. The Champion will be available at a later time. ・For discussion of the champ spawn visit the forums. ・Resolved issue where players couldn’t access all parts of a vault that were located at higher vault positions. ・Purchasing a vault now provides a receipt which lists the location and next bill date of the purchased vault. The receipt will update once it is past the next bill date after server maintenance. ・The vault manager now barks the number of objects within the vault to the owner when opening their vault. ・The warning message when a player claims a vault now provides more information. ・Added options in the Enhanced & Classic client to disable flying animations. ・Added an option in the Classic client to display large bank and vault gumps.